Spontaneous cerebro spinal fluid (CSF) otorrhea or temporal CSF leakage represents a difficult and serious condition to deal with, in term of its diagnosis, especially with intact drum, management and its sequalae if not treated or diagnosed. the clinical presentation, the types of leaks and which are the best approaches to repair it are reviewed. In the other hand, spontaneous CSF otorrhea is rare entity, , can be easily missed in adults and often not diagnosed until a myringotomy or tympanostomy tube is placed. Any patients, especially adult older than 50 years with a negative history of otologic disease who have recurrent serious otitis media should be evaluated for this pathology. There is no doubt that the condition needs immediate attention and correction because of risk of devastating meningitis infection. Usually, CSF leak can result from a defect in the dura and skull base. CSF leakage can trickle down through the Eustachian tube More Details to be presented as CSF otorhinorrhea or nasal discharge. Review of literatures in the last 5 years with focus on different presentation and modalities of treatment. The majority of patients presented with symptoms of aural fullness, middle ear effusion, hearing loss and for certain extent with headache and meningitis. Some patients had multiple defects in the tegmen and dura, and some can have meningoencephaloceles, can be seen behind the tympanic membrane. CSF pressures and the hydrostatic pulsative forces may lead to the development of pit holes on the middle fossa at the sites of arachnoid villi with herniation of dura/ arachnoid or brain tissue. If such defects are located over the underlying well pneumatized middle ear, encephalocele can develop and lead to CSF leakage into the affected site. 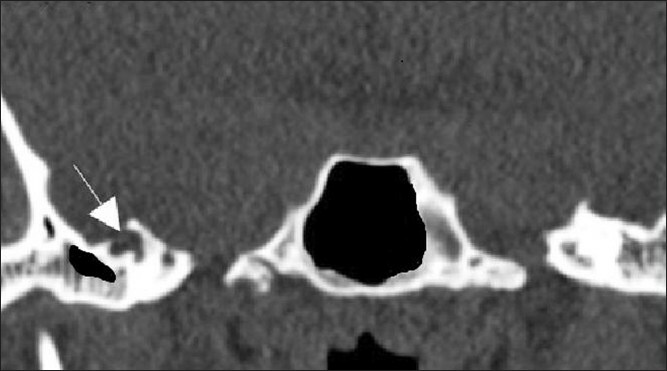 Therefore, erosion of bone by arachnoid granulations is only significant when it affects a pneumatized part of the skull  [Figure 1] and [Figure 2]. Both, computer tomography (CT scan) and magnetic resonance image (MRI) play an important role for the diagnosis. The high resolution CT scan with fine cuts (1 mm or less) can shows the direct anatomy and the relationship in different parts of temporal bone and can give indirect evidence of the CSF fistulae by revealing bony defects and opacification of middle ear or mastoid air cells. As a role, if there is a bony defect at base of skull with fluid in the dependent area or sinus then CSF leakage should be rolled out. Magnetic resonance cisternography in particular can non-invasively reveal CSF leakage in multiple planes without the disadvantage of ionizing radiation. On the T2-weighted spin-echo image sequence, is a superior to other modalities, the bright signal from the CSF column is well visualized against the middle ear cleft or sinus background of air. MRI is essential to confirm the nature and extension of the lesion and any associated abnormalities. MRI is able to provide multiplanner images of the encephalocele that is useful for both diagnosis and surgical planning. There are two well known surgical approaches, the middle fossa craniotomy and the transmastoid approach. The management require adherence to the principles of establishing a safe ear as a primary goal, then with hearing restoration as a secondary goal. As it is difficult in its presentation, the planning to repair it is also difficult with the middle fossa craniotomy provides the best exposure for defects involving the middle fossa floor, but not all neuro-otologist or the neurosurgeons are familiar with it. Wootten et al. showed that, both alloplastic and autologous materials are highly successful in repairing the defect(s) responsible for CSF otorrhea. No infections of the alloplastic bone cement occurred in their 17 cases series. Surgical repair is mandatory to seal these non-traumatic CSF leaks. A multi-layered closure technique in which autologous and artificial materials are combined is considered to result in the highest rate of success. Transmastoid approach in the other hand with fascia, bone paté and fibrin glue is more popular to otologist and it is an easy to visualized the defect from the roof of middle ear. In this interesting study of these 56 cases, 12 had CSF otorrhea alone, 19 had encephaloceles, and 23 had both. Two patients presented with spontaneous pneumocephalus without CSF leak. Thirty-three patients had spontaneous onset of their lesion without any history of temporal bone surgery or trauma. This difference was found to be statistically significant. Six of these had either preceding or subsequent contralateral mastoid or anterior fossa (sphenoid, ethmoid) CSF leak. Intracranial pressure was evaluated in these cases and most underwent ventricular-peritoneal shunting to reduce their intracranial pressure. Sixteen cases followed previous mastoid surgery or chronic ear disease and 7 were attributed to previous temporal bone trauma. Lesions were repaired with the transtemporal approach (42), middle fossa (4), and combined (5) approaches. Five cases required petrosectomy and fat obliteration. There was one recurrent CSF leak 4 years after initial repair; the leak was anterior to the previously placed bone graft. Comparing different techniques and grafts, there were no differences in the surgical outcome. Brain herniation and/or CSF leak appear to be rare complications of surgery for revision chronic ear diseases. CSF leak occurs when there is an osseous and dural defect at the skull base,  with direct communication of the subarachnoid space to the extracranial space, usually a paranasal sinus. Recognition of this leak site and source and appropriate treatment are necessary to avoid rhinorrhea or otorrhea, low-pressure headaches, and meningitis, known complications of CSF leak. The imaging evaluation has evolved over the past several decades. Description of current techniques available to direct treatment options, including multi-detector thin section computed tomography, and imaging recommendations are presented. Five patients underwent combined middle cranial fossa/transmastoid repair. Materials used in repair included temporalis fascia, free muscle graft, oxycel cotton, calvarial bone, pericranium, bone wax, and fibrin glue. Recognition of CSF otorrhea can be difficult and challenging as the complication can be devastating and serious. Repairing the defect is mandatory to prevent these complications. Different technique and approaches had been attempted with varieties of materials with almost similar result and success. For otologist, transmastoid approach can be considered a good approach for repairing, except if there are multiple defects where middle cranial fossa approach will be adequate. Otolarynglolgy and Radiology Departments in King Saud Medical City, Riyadh. 2. Kari E, Mattox DE. Transtemporal management of temporal bone encephaloceles and CSF leaks: Review of 56 consecutive patients. Acta Otolaryngol 2011;131:391-4. Epub 2011 Feb 11. 3. Connor SE. Imaging of skull-base cephalocoeles and cerebrospinal fluid leaks. Clin Radiol 2010;65:832-41. 4. Bullock R, Soares D. Current imaging of cerebrospinal fluid leaks. West Indian Med J 2009;58:362-6. 5. Wootten CT, Kaylie DM, Warren FM, Jackson CG. Management of brain herniation and cerebrospinal fluid leak in revision chronic ear surgery. Laryngoscope 2005;115:1256-61. 6. Wootten CT, Backous DD, Haynes DS. Management of cerebrospinal fluid leakage from cochleostomy during cochlear implant surgery. Laryngoscope 2006;116:2055-9. 7. Brown NE, Grundfast KM, Jabre A, Megerian CA, O'Malley BW Jr, Rosenberg SI. Diagnosis and management of spontaneous cerebrospinal fluid-middle ear effusion and otorrhea. Laryngoscope 2004;114:800-5. 8. Lloyd KM, DelGaudio JM, Hudgins PA. Imaging of skull base cerebrospinal fluid leaks in adults. Radiology 2008;248:725-36. 9. Kutz JW Jr, Husain IA, Isaacson B, Roland PS. Management of spontaneous cerebrospinal fluid otorrhea. Laryngoscope 2008;118:2195-9. 10. Toh A, De R. Spontaneous cerebrospinal fluid otorrhoea presenting as otitis externa. Eur Arch Otorhinolaryngol 2007;264:689-91. Epub 2007 Jan 25. 11. Shetty PG, Shroff MM, Fatterpekar GM, Sahani DV, Kirtane MV. 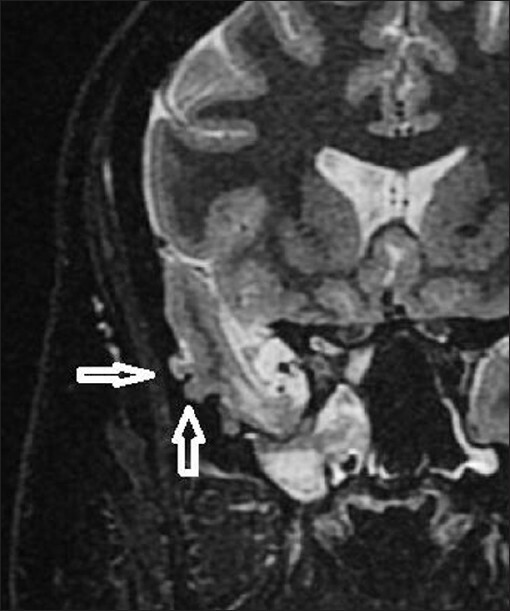 A retrospective analysis of spontaneous sphenoid sinus fistula: MR and CT findings. AJNR Am J Neuroradiol 2000;21:337-42. 12. Schuknecht B, Simmen D, Briner HR, Holzmann D. Nontraumatic skull base defects with spontaneous csf rhinorrhea and arachnoid herniation: Imaging findings and correlation with endoscopic sinus surgery in 27 patient. AJNR Am J Neuroradiol 2008;29:542-9. 13. Shetty PG, Shroff MM, Sahani DV. Evaluation of high-resolution CT and MR cisternography in the diagnosis of cerebrospinal fluid fistula. AJNR Am J Neuroradiol 1998;19:633-9. 14. Stenzel M, Preuss S, Orloff L, Jecker P, Mann W. Cerebrospinal fluid leaks of temporal bone origin: Etiology and management. ORL J Otorhinolaryngol Relat Spec 2005;67:51-5. Epub 2005 Mar 7.